It is a lonely ride over rails with a steel monster, an old electric locomotive 194, built in 1954 – run by a woman. Barbara Pirch serves the locomotive with maximum physical performance. “Nothing is automatic here, everything runs manually.” Barbara Pirch from Willich near Düsseldorf owns Germany’s smallest railway company and is an absolute rarity here. With its two old electric locomotives, it transports freight wagons. It drives so-called ad hoc assignments for its customers throughout Germany, transporting cars, diesel, wood, gases or coal. Your life is one on call, without comfort and planning security. Rarely does she know what the day brings. She sees no reason to deny the old locomotives just because they are old. 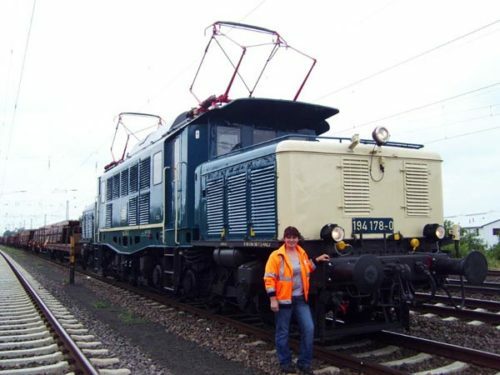 The 46-year-old, who used to be a locomotive driver for the Deutsche Bundesbahn, bought her two locomotives in 2008. “This is real manual work and not a comparison to the modern ICE,” says the trained fitter, who repairs the locomotives herself. “The old electric locomotives are technically simple reliable and a modern locomotive would not irritate me”. Their locomotives from the Reichsbahn period also make the hearts of many railway enthusiasts beat faster – but romanticism has less to do with their operations, says Pirch. “It’s a tough business on the rail and there is a big competition in freight transport.” It is true that freight transport by truck is still on the road, but it also grew by 5.4 percent in the German rail network in 2011. Since 1994, the rail network has also been open to private companies, with around 7,000 locomotives in operation in Germany, and currently some 400 railway companies exist. Spiegel TV has also interviewed Barbara. The company has two Deutsche Reichsbahn Class E 94 heavy electric freight locomotives – 194 158 and 194 178. Between 1992 and 2008 Barbara also owned DB Class V200.1 diesel locomotive 221 135. This entry was posted in Trains and tagged electricity, freight trains, Germany, rail freight. Bookmark the permalink. Barbara Pirch`s two (now one) series 194 electric historic machines are well known amongst not only ad-hoc freight customers but also amongst all rail enthusiasts – and there are ten thousands of this species by now in Germany and Austria….. More than one of these groups and clubs wanted her 194 pull a historic special, but she`s too busy with her bread-and-butter work as to engage in railfan specials, too. Although she herself is probably the greatest rail fan of them all, running and working such a monster of the last century. There are a few 194`s preserved in yards and museums in Germany and Austria, but to the best of my knowledge none of them being workable on the line. The very last one in daily operation, besides Barbara`s, used to be the blue 194 of MWB, Mittel Weser Bahn, another private German entity involved in freighting (although on a very much larger scale than Rail4U). The interesting matter of this MWB 194 was the fact that it was based for a couple of years in Laufach, Germany (not far from where I used to live, passing this gem almost every day) and used for on-demand pushing heavy freights as an assistant up the steep gradient towards Heigenbruecken (on the main line from Frankfurt to Nuremberg) as far up as to the Schwarzkopftunnel (Black Head Tunnel). This tunnel itself is now out of running, since in summer this year, a new line circum-navigating the gradient and tunnel has been inaugurated, and the old tunnel is planned to be filled with material. What a pity. Great farewell events were run up and down the hill days before it was closed. Modern times, that is….. This very MWB blue pusher 194 has now been sold to SLB (Salzburger Lokalbahn, Salzburg local rail) in Salzburg, Austria, quite a history-conscious company which makes hope that their very 194 will escape the axe! Incidentially, this pusher-assisted freight line was only one of two such remaining in Germany, the (active) second and last one being up he Geisslinger Steige (the Geisslinger ascent), a very lively main ICE route from Stuttgart to Munich. How great to see Barbara`s locos featuring in a web page like yours from the other end of the globe…..
Incidentially, her bi-coloured blue and yellow machine is available from various HO scale model railroad providers (in addition to the usual green ones) as is MWB`s bright blue one. I am overly proud and happy that I can boost both models, the blue MWB 194 and the blue MWB support wagon in my model collection – probably not a high value by today`s financial standards, but invalueable as a collectors item). Thanks for the extra info Hubert! While working on this site I’m continually surprised by the interesting railways that exist across Europe, but never heard of because no English speakers have written about them. I would not remember if I had mentioned this at my initial response to you ref. Barbara s E194, or not. The blue MWB 194 were available as HO scale model many years ago – sold out since decades, so to speak. Both Fleischmann and Kleinbahn of Vienna had the 194 in their program, while PIKO of Sonneberg had the original support wagon “on line”. I am so overly happy to have them both, the (Kleinbahn) 194 and the PIKO support wagon in my collection, a real eye catcher and pleasure every time I look at them (reminding me of passing the combo almost daily at Laufach station long ago). “Klein”bahn (rail) does not stem from Klein as Small but the two founder brothers had the family name of Klein, a rather popular and wide-spread name in Austria. A funny, but fitting co-incidence. Kleinbahn was (and still is) rather a toy model company, not to be compared with Maerklin or Roco or such-like, but once in a while they have a model on their cards that others dont have…..
Klein Modellbahn, with a similar sortiment but at much bettered quality and details. And triple the prices, that is. As a result, Klein Modellbahn folded after a few years already, while the original Kleinbahn still exists today, although in a very small style. Kleinbahn never had retailers sell their products but you could only get them either by mail order or in their own mini-outlet stores in the cities of Vienna (3), Graz, Klagenfurt, Linz, Salzburg, Innsbruck and Bregenz (1 each), such virtually in every provincial capital. Step by step over the years, all those mini-stores except a single one in Vienna (plus a small shop at the outskirts of Vienna attached to their production facilities) folded and closed, and to the best of my view, the future of Kleinbahn looks bleak, very much as Klein Modellbahn did at a certain time. Kleinbahn (and the remaining Klein Modellbahn models) are collectors gems by now, although of lower quality than their competitors. There is a faithful Kleinbahn fraternity to this date, one of those fellows is writing to you today. I can vividly remember when as school kids we were pressing our noses towards the show room windows hoping for the almost impossible…..